The Rio 2016 Paralympics starts today and will run from the 7th-18th September, with 528 gold medals up for grabs (25 more than London 2012) over the 11 days. But how far has the multi-sport, global event come and what has it come to mean for learning disabilities? We are lucky that we now live in a world where equality continues to climb the agenda in most first world countries. Iconic sporting events play a huge part in helping people to recognise that individuals should not be discriminated against due to their beliefs, colour, disabilities or anything else that makes them who they are. Events such as the Olympics unite people from all walks of life as they compete on the same stage. The only thing that they are separated by is their sporting ability, and, more specifically: seconds, metres, millimetres – the finest of margins which divide the medalists from the non-medalists. Up until the 1960’s, competing at the Games was only possible for able-bodied people. However – and thankfully – this all changed at Rome 1960, when the first Paralympic Games was introduced alongside the traditional Olympics, allowing athletes with spinal cord injuries to compete against one another within their own category. Since then the Paralympics has gone on to become more accommodating of disabled athletes. There are now 10 impairment categories, allowing people with disabilities ranging from limb deficiency to visual impairment to compete. Athletics and swimming are the only sports to include events for all ten impairments. 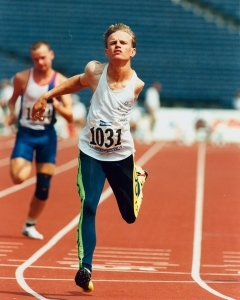 Athletes with learning disabilities were first allowed to compete at the Atlanta Paralympics in 1996 under the category ‘Intellectual Impairment’, marking a huge step forward for anyone with a learning disability and demonstrating the progressive nature of the Games as a whole. Special events are made up for those competing in the learning disabilities categories, as conditions can affect reaction time, spacial awareness, memory, concentration and a range of other factors that impact differently depending on the sport. Not only did the new Paralympics category ensure that athletes with learning disabilities could compete at the world’s largest sporting event for a chance at glory and the opportunity to experience a certain kind of patriotic pride only attainable through representing one’s country on a global stage. It also allowed the rest of the world to see how doors were open for intellectually impaired people and if – they’re open to them at such a global event, then that kind of inclusiveness should rightly extend to all areas of life, from employment to social settings. However, after only two summer games, the progressive nature of the Olympic and Paralympic Games came under threat. At the Sydney games in 2000, 10 of the 12 Spanish Paralympic gold-winning basketball team were later found to have cheated the system by making up their intellectual impairment. This led to the removal of the category, and athletes with learning disabilities were unable to compete in Athens 2004 and Beijing 2008. Thankfully the category was re-introduced at London 2012 after extensive improvements were made to the testing methods. In London 2012, there were 10 British athletes with learning disabilities who competed in athletics, swimming and table tennis. This year, there will be 18 medal events for athletes with learning disabilities, with seven – all swimmers – representing Britain in Brazil. Having athletes with learning disabilities competing against one another on televisions around the world no doubt serves as excellent inspiration for those with similar conditions. Getting active is important for everyone regardless of whether they have a learning disability or not. There are many national campaigns designed to encourage adults and children with learning disabilities to get involved with sport. The new ‘Together We Will’ campaign – run by the English Federation of Disabilities in Sport – encourages disabled people, including those with learning disabilities, to become more active and to lead healthier lives. For instance, the organisation has details of a multitude of events and activities taking place across the country each month, including, for example a snooker day for people with learning disabilities on 14th October. Elsewhere, there’s also the Special Olympics, which is recognised by the International Olympic committee. It provides training and competition in a variety of sports for people with learning disabilities.